Mike Felix, Gilbert Lucas and Lenny Blanche had originally started out as a three piece jazz combo before adding Red Lambert to the line-up. At this point they became the Migil 4, making the unusual name up for the group from the first two letters of founders Felix and Lucas christian names. It was in this new guise that their style took a turn towards rhythm and blues. However, it was the addition of saxophonist Alan Watson- thus becoming the Migil 5- that allowed them to create a fuller sound. It was this line-up that produced their only UK top ten hit, "Mockin' Bird Hill". It is notable because, although the group came out of the North London area, it adopted a strong 'ska' beat which was then still unusual outside of the West Indies. Pictured on the right is the Migil Five's sole release on the EP format (Pye NEP24191); now extraordinarily difficult to find in nice condition. The cover has a great picture of the group as they were in 1964 and the disc contains songs that are very difficult to obtain in any format. These include their interpretation of the Johnnie Ray classic, 'Cry'. Apart from one further minor hit in a similar lilting style to Mockin' Bird Hill, the group were unable to find much more success on record. They continued to prove popular live performers, but the original quintet began to fall apart beginning with the defection of drummer/ lead vocalist Mike Felix who wanted to try his hand on his own (he cut two unsuccessful solo singles- see obscure artists-m). The Migil 5 went on playing until 1971 with Norman Langford replacing Alan 'Earl' Watson- who left in 1969 to run a Canvey Island pub. In fact the group seems to have generally drifted towards Essex- Lenny Blanche started a successful restaurant (The Boatyard) at Leigh On Sea and Gil Lucas moved into the business of pub and entertainment management, but didn't give up his music. Up until the time of Gil's untimely death he was still playing in a trio in the Palm Tree, Mile End. So sadly we are not going to see the original Migil 5 on the nostalgia circuit. Pye 7N15572 1963 Maybe/ Can't I? 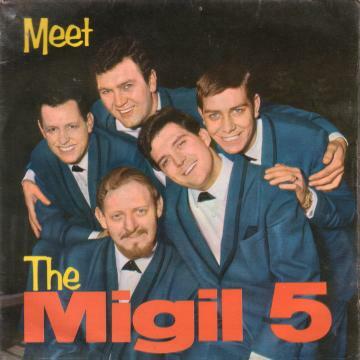 Pye NEP24191 1964 "Meet The Migil Five"